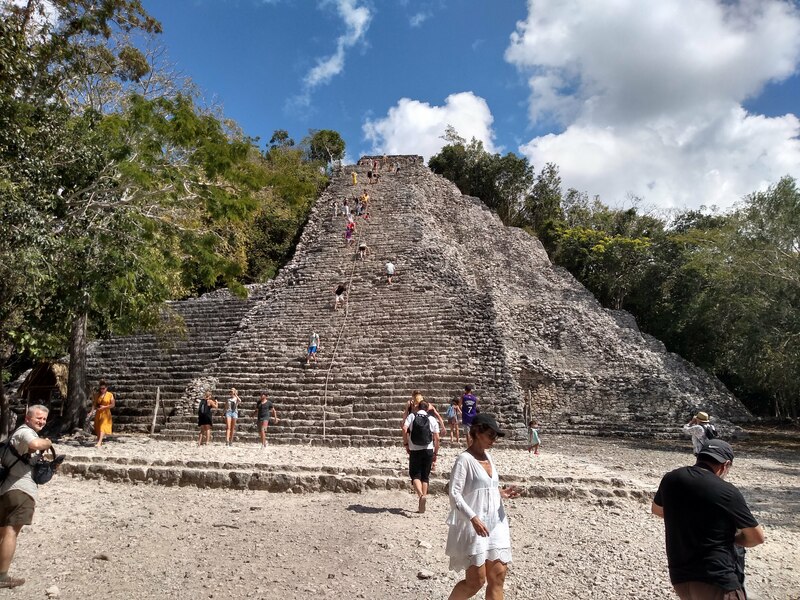 There doesn’t appear to be a service direct from Cancún to Cobá, so our two-day trip was a suitable compromise, which allowed us to also sample what Tulum had to offer. 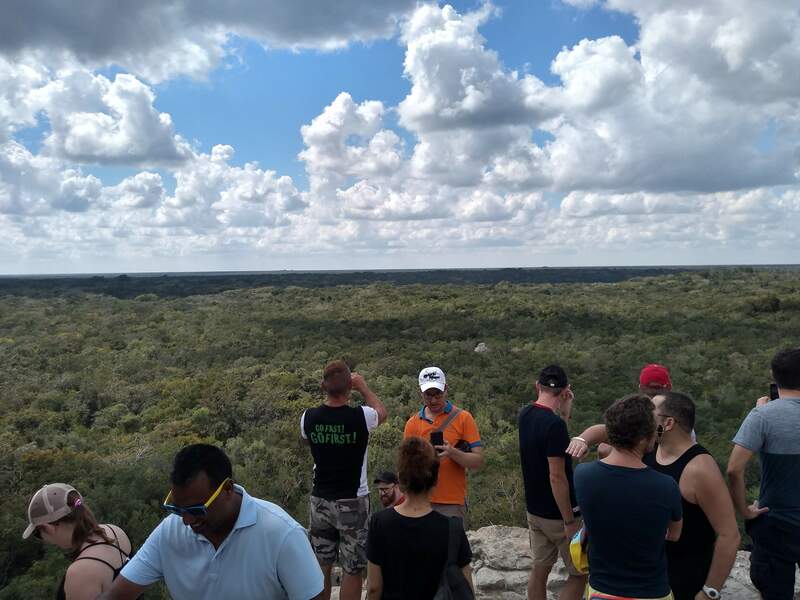 The outbound ADO service from Tulum to Cobá is around 10.30 in the morning, and the same bus returns to Tulum at around 15.00 in the afternoon. It’s roughly a 30 miles or 40 minute journey each way, which allowed us over three hours to explore the site. ADO tickets Tulum to Cobá 94 pesos (£4) single each. 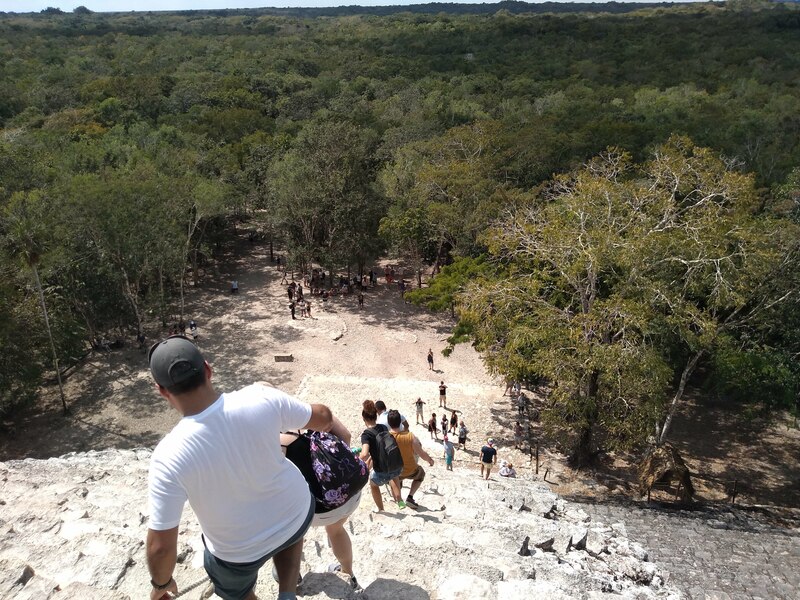 One of our main reasons for visiting Cobá is that unlike Chichén Itzá where the monuments are fenced off, here it is still possible to climb the massive Nohoch Mul pyramid. Chichén Itzá’s famous Kukulcán pyramid is 24 metres tall, while the lesser-known Nohoch Mul is 42 metres, making it the tallest pyramid in the Yucatán peninsula. Admission to the site 75 pesos (£3) each. Once through the entrance gates, the site stretches for about a mile through the low jungle, with the Nohoch Mul being the furthest point to walk to. Locals operate a tricycle rickshaw service, but we were happy to crack on with a fast hike in the shade of the jungle canopy, to try and reach the pyramid before some of the tour groups beginning to enter the site. I have to admit to being a little apprehensive about both the height and the steepness of the pyramid climb, and in advance I didn’t think I would be able to complete it. So my wife went off first, armed with a cheap action camera I had picked up for the holidays. Having seen the relatively short work she made of both the climb and the descent, and keen to see the view from the top for myself, I steeled my resolve and set off slowly for the summit. Having both achieved this daring feat, we started a slow walk back in the shade of the jungle canopy towards the entrance, stopping to view all of the other ruins as we passed. Our journey back took us once again through Tulum bus station, where we had a short wait for the next scheduled service back to Cancún. Tomorrow, we plan on a quieter day around the resort, relaxing and unwinding by the Caribbean. I’m glad you managed the pyramid climb and were able to take in the far reaching views. Another interesting post Stuart. I think it was my ‘Mount Everest’ moment, Marion. Such a feeling of elation getting to the top, but then so relieved to get safely back down again!